We came to Kotpad to visit the Samrath family at their cottage industry home. They do their weaving and dying on a small compound on the weaver's street of the village. Mr. Samrath came all the way on the bus from his village to meet us in our hotel in Jaypour. It is a long ride! He stood there in his shawl and monkey cap in the darkened hallway, beaming and shivering in the cool morning air. We talked him into a chai as we were just having breakfast. After much jostling of furniture in the warm sun on the balcony we sat and he told us about his village. Deciding to stay the second night in nearer to the village Jagdalpur, we took all our luggage with us and trondled over with a bike rikshaw to the bus stand. Mr. Samrath kept good pace with us on foot. He is a fit, wiry man in extreme health as appears is his whole family. It was a pretty two hour bus ride through the countryside and small towns. The people watching from the bus was spectacular. 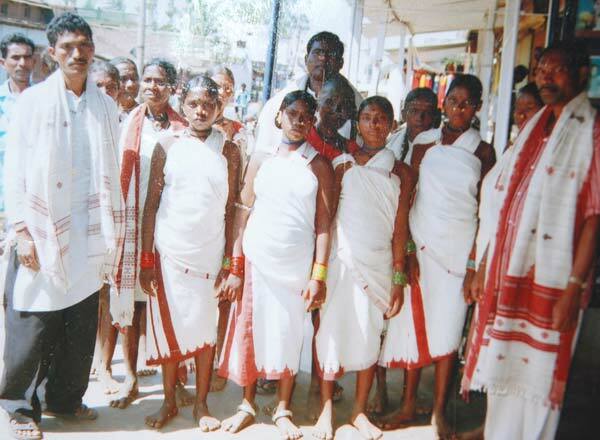 There were plenty of Bhatra tribals wearing the distinctive, knotted at the shoulder sari drape. 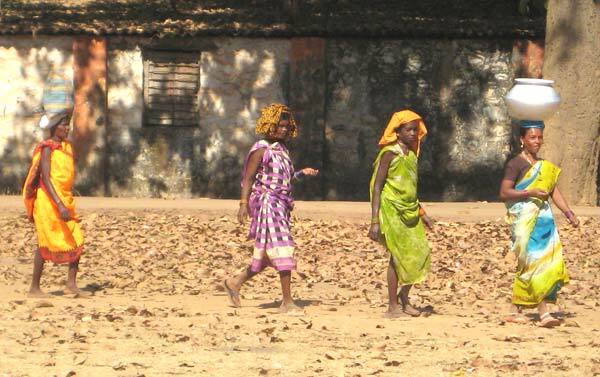 We passed so many rows of women, walking in sync with water pots, loads of firewood or fodder balanced on their heads. 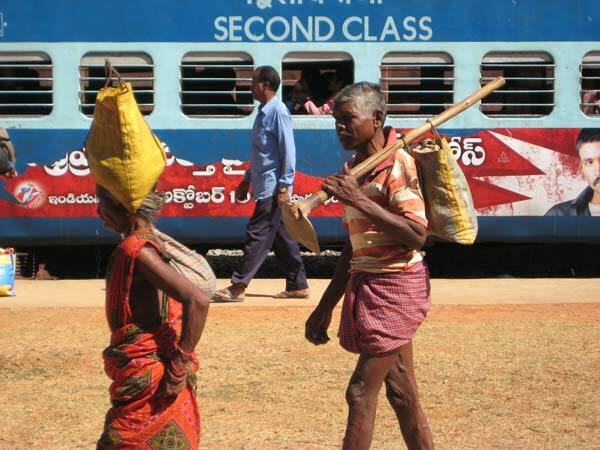 Even on the road, they walked in line as if they were still on a paddy path. The tribal sari drape is worn without a choli and covers the breasts fully and securely with a shoulder knot. These were traditionally draped with much shorter lengths of thicker, completely opaque cotton. Mr. Samrath weaves these types of sarees for the tribal people here. Mostly they use 6 yard sarees to make this drape now. The Samrath family - hundreds of years doing it just this way! The Samraths live on the Miri Gam street with the other weavers of this tradition. They live in a beautiful, spotless small house with a polished front stoop that beckoned us to sit in the shade and gaze around at the idyll. The Samrath's are two brothers, with 5 and 3 children and over the course of the hours we got to meet all of them and a bunch of other neighbors and curious visitors. The weavers of Kotpad hold diligently to tradition. The temptation would be there to experiment with new designs or faster techniques, but Samrath says "we owe it to our heritage to remain pure to the form." Samrath tells me that he was encouraged by the co-op officers to branch out and learn to use some other natural dyes. He learned to work with indigo, but hesitates as it is not in his tradition and he does not like its fugitive nature. 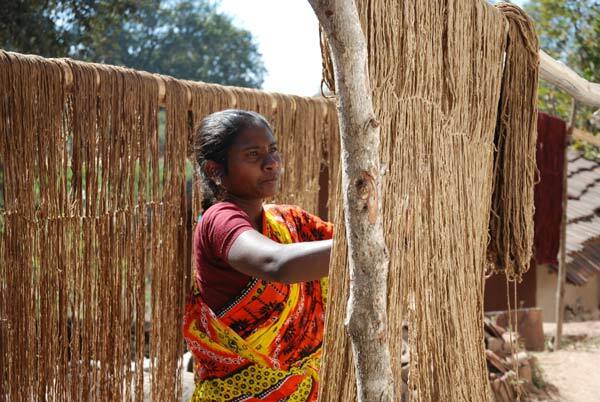 The cloth is made from mill spun yarn, puchased in a neighboring market in Bastar, Chattisgarh. Cotton grown in this region is spun into varying count fibers for towels, lunghees and sarees. 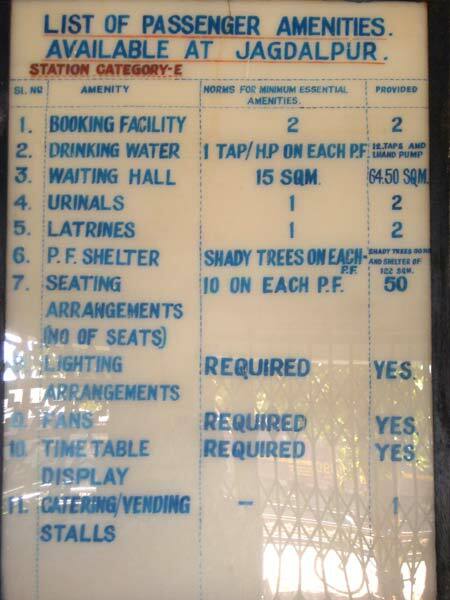 Samrath's fine quality is 120 counts, normal quality is 90. The Samraths are heavily engaged in the business of their craft and work all day every day on some aspect of the production. Dying is an long winded process of repeated mordanting and drying, dye soaks and rinsing. It takes a total of 15 days just to get the dyed fibers. 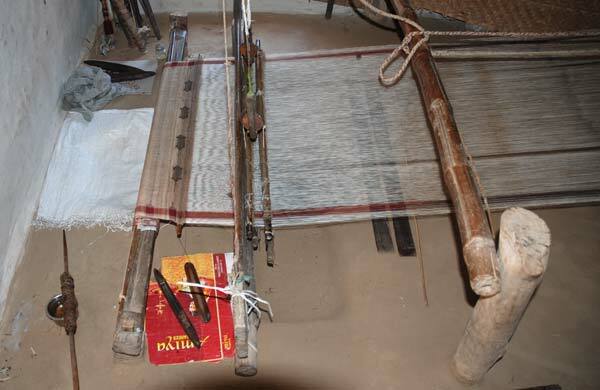 Then the actual weaving of the sari takes another 20 days of measuring out warps, dressing the loom, winding plenty of bobbins, and weaving all ornaments in by hand on a very simple loom. In Kotapad it is all about time. No one else is willing to do this work. 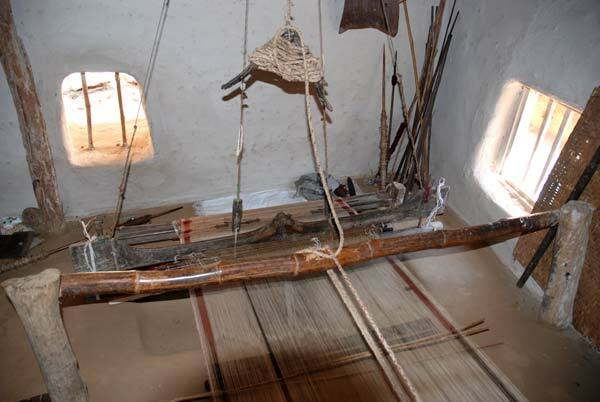 Unlike most weavers the Samraths are independent. 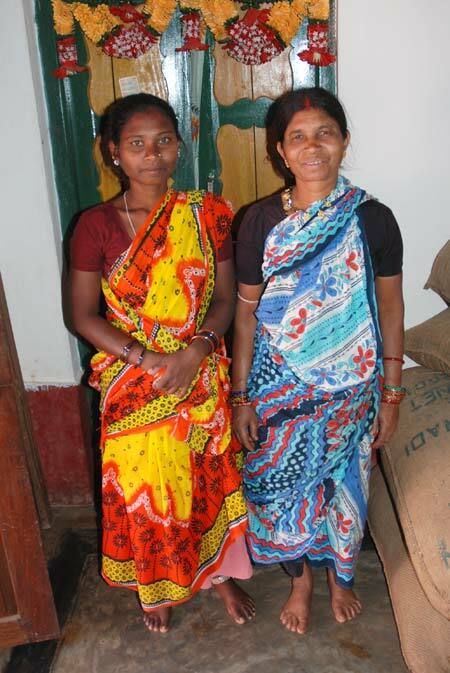 They purchase their own fibers and sell the sarees directly. Most weavers in India work on a piece basis and are contracted to middleman who makes all the money. The Samraths and their neighbors exist in a small time bubble of improbability, luckily there is a market for their goods in India. The untreated natural cotton colored yarn is often bleached whiter for the white grounds. 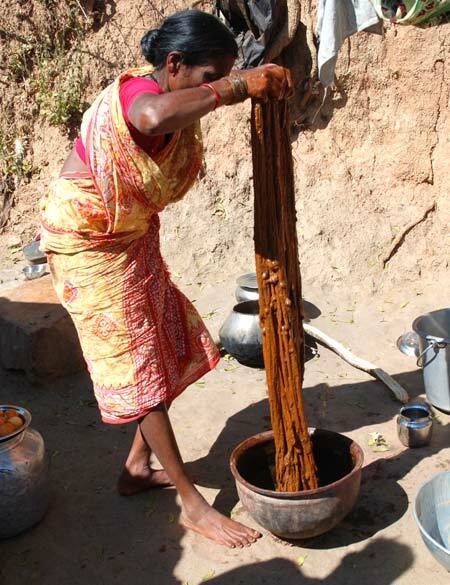 Castor oil and cow dung paste are massaged into the hanks of yarn and they are soaked in ash water baths and then dried in the sun for 12 days to get an even light color. The massage happens by way of the dyer's feet, which is probably alot easier on the dyer. This process is surprisingly gentle on the fibers which are rendered incredibly soft by all the massaging. 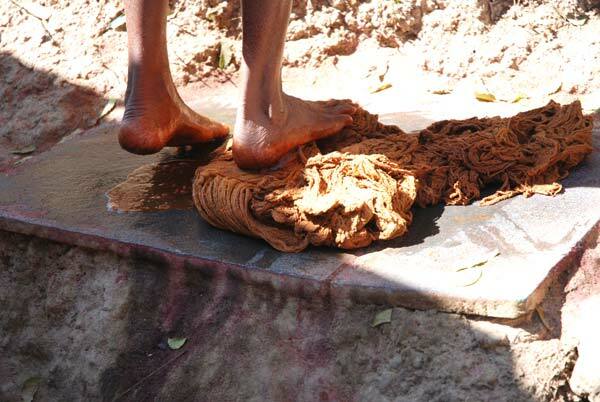 The colored fibers are also mordanted with cow dung and ash water rinsed and dried for 14 days before they are put in the dye bath. The weavers on this street have been give a 7 hectare plot of land where the aal roots can be harvested. The plant only grows wild. The roots are dug out and bits of them are chipped off and collected for drying. There is a brittle red bark on the root which gives the color, this is chipped off and ground to a fine powder in a stone mill like the ones used for spices. Aal bark drying in the sun. A thick sludge of finely grownd aal powder and boiling water is stirred vigorously and the hank of fine yarn is dipped and wrung through with the mixture. The fibers are wrung with the feet, completely impregnating them with dye. They are then returned to the dye pot to soak for the rest of the day in the sun. 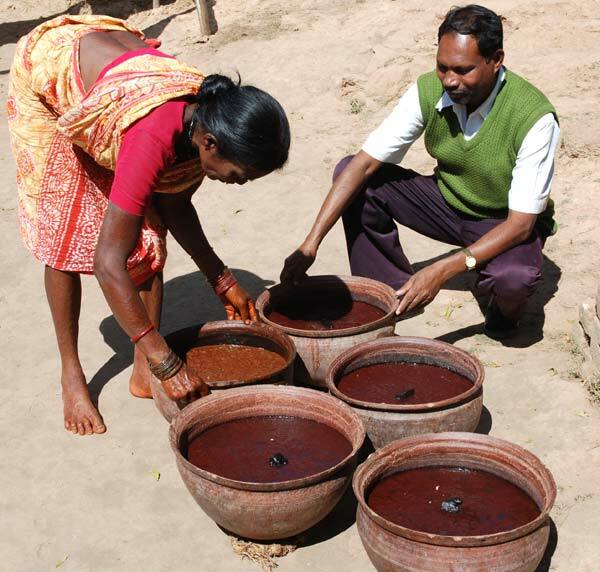 The dyepots are given a black tikka of charcoal to protect against evil eye while they are getting their all day sun bath. We watched the pots slowly turn redder as they sat in the sun. 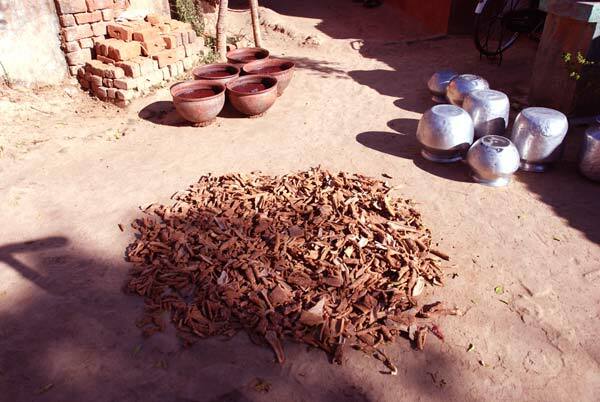 Only clay pots are used for the process. The aal can be made browner by the adding iron dust to the dye pot. The fibers are always dyed and dried at least twice. If an even deeper color is required they will be dyed a third time. The fibers are sun dried after a long afternoon soak in the dye bath, which reduces quite a bit by evaporation over the course of the afternoon. The long thorough mordanting has made the fibers so receptive to the dye that no further fixing is necessary. The maroons, pinks and browns are exceptionally fast and wildly complex colors. They also use some turmeric root for getting a pretty yellow color, although this is a new addition to their repertoire. Woven on incredibly simple looms. Most weaving centers can warp 2 or 4 sarees on their looms, the Kotapad weavers do everything one at a time on a simple loom. All ornament is done by hand with small shuttles of yarn. The loom is totally rudimentary with thread heddles tied to foot pedals to make the shed. Their ornaments are all very traditional and woven through the generations. Mr. Samrath gets requests to change his designs from his wholesale buyers but he wants to stick to tradition. These sarees and shawls are generally done in two colors, one ground and one ornament color, which is traditionally red on white grounds. All ornament is made with the secondary color. They weave in pure cotton, silk and silk/cotton mix. When you feel this fabric you can feel all those hours of intention put into it - they have some incredible level of softness magic, there is nothing like it! You can purchase the Samrath's woven magic in the Sarishop. 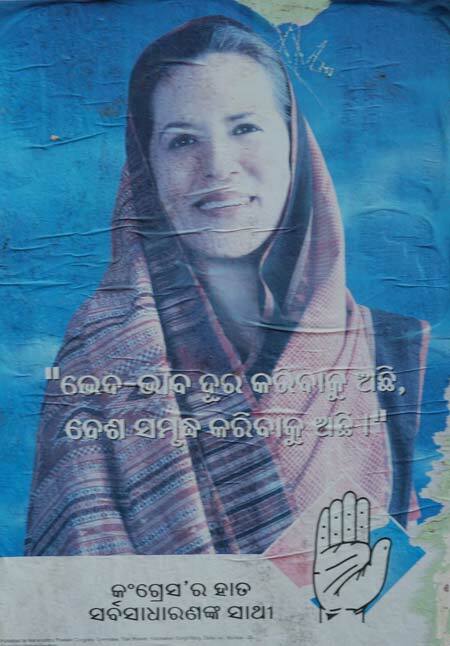 Sonia Gandhi's congress party poster has her draped in a beautiful Habaspuri sari. She knows how to appeal to the senses of the locals, and is always perfectly outfitted at local functions. To sterilize her political reputation she wears cholies cut like a nun, long waisted with extremely high necks. She is a widow and there is no more hanky panky for Sonia, at least not in public. Just to confirm what I had already assumed, that the local market for sarees here in Jagdalpur is bleak, we went wandering down the main road. It is as so many small towns in this region - there is not one cotton original Orissa sari to be found just outside the border in Chattisgarh either. It seems all the original stuff goes to the big cities. The poorer villagers and small towners want the convenience of polyester and the "modern" image it projects and they don't want to feel villagey. 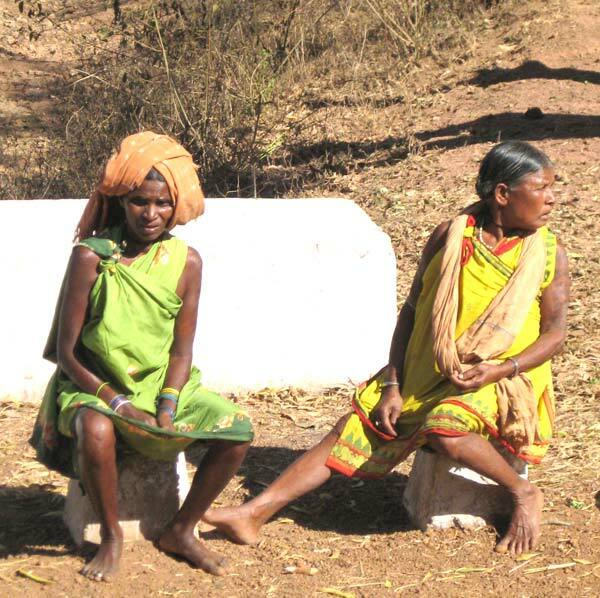 NAXALITES block roads in Chattisgarh - Plan Change! In Jagdalpur we found ourselves at the end of the railroad line on the Chattisgarh border. Tracing out the safari path on the map Warangal looked like a good day's journey away. I thought it might be good to look at the markets there, but we found out that Naxalites had blocked the road, we couldn't proceed as planned. There were no busses running, hiring a taxi might work, but would require a big drive around the action. The Naxalites had put boulders, trucks and other large debris on the main highway. The papers reported the police have been firing on them and arresting them day by day. They were protesting on Republic day - and it really is sort of sad - they were only asking for price controls on essential food commodities and agricultural seeds. Once again, plan change! So we got back on the same train, this time during daylight and made the slow descent back down the eastern ghat to the sea again. The ride was just so beautiful and we were lucky to have a compartment all to ourselves the entire time, so we could enjoy the ride. The hills were spotted with green terraced rice fields, patchworks of fallow fields with grazing goats and cattle, water buffaloes pulling plows and secluded hamlets nestled in the forested hills. After life in big city India, the peaceful feeling of the clean Indian countryside is such a balm to the senses.